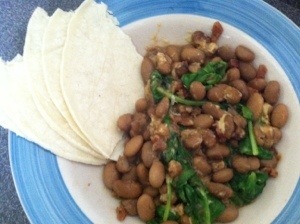 Microwave or heat in a pan: beans, spinach and bacon. Add in a squirt of Dijon and heat again til warm. Stir it all together. Serve with corn tortillas on the side! Super, super easy and tasty. Another great idea would be to add a little brown sugar or maple syrup to make these more “baked beans” flavor. The bacon I used was already crumbled so it had a little brown sugar in it. And while I am an advocate of bacon in everything, it can easily be left out if you don’t eat or like bacon! Posted on July 31, 2013 September 24, 2013 by Olivia FecteauPosted in foodTagged bacon, beans, food, gluten-free, lunch, recipe, yummy.